2.1 At the invitation of the People’s Republic of China (PRC), a delegation of Parliamentarians undertook a visit to the Tibet Autonomous Region (TAR). The invitation followed a series of meetings in which Chinese Ministers and Chinese Tibetan scholars were received in the House of Lords by Lords Alton and Steel. Discussion at those meetings focused upon talks between the Dalai Lama and PRC. Concerns about religious liberty and human rights were also expressed. 2.2 The decision taken by the All Party Parliamentary China Group to support and facilitate a delegation to Tibet, in order to investigate the situation and report their findings, has the full support of the All Party Group on Tibet (of which Lord Steel, Lord Alton and James Gray are members) as well as the blessing of the Dalai Lama. 2.4 We consider that having a balance of representation from across the political spectrum as well as members of both Houses of Parliament strengthened the delegation. To publish a report detailing our findings. 2.6 Our willingness to travel to Tibet does not imply that we consider ourselves to be “overnight experts” or to have a monopoly on wisdom. Nor did we set out in the belief that we would have the opportunity to meet freely with those who have been involved in the opposition movement. We are well aware that our movements and meetings were selective and circumscribed to an extent. 2.7 However, we were of the view that there is a role for British parliamentarians in helping to facilitate dialogue, and that such dialogue is contingent upon a willingness to listen and engage with the Chinese perspective – fostering friendship and trust. 2.8 The delegation was grateful to have the opportunity to speak with UK Foreign Office Minister of State, Ivan Lewis MP, via teleconference whilst he was in Tibet and learn of his observations shortly before our own departure. The delegation welcomes the visit of a Government Minister as evidence of the importance with which the UK Government views the situation in Tibet. At the time of writing a followup meeting with Mr. Lewis was scheduled to take place in midOctober 2009. 2.9 Tibet has had a varied and relationship with China for many centuries. However, the nature of this relationship has not been consistent, alternating between periods of greater and lesser autonomy. 2.10 The precise historical status of Tibet is a source of much controversy, with contradictory assertions of historic independence or incorporation. The PRC adamantly claims that “Tibet has always been part of China”, whereas the Tibetan ‘Government in Exile’ assert that “Tibet has always been a sovereign state”. These rival claims, however, overlook a more nuanced historical reality. Tibet was a part of the Mongol and Manchu empires along with China and Mongolia. At various times the Tibetans have recognised the leading status of the Emperor of China as have the Vietnamese, Koreans and others. 2.11 One preliminary difficulty is that of definition: what constitutes Tibet? Neither its size nor population are simple matters of fact due to various entities claiming differing parts of the area as a Tibetan region. What is sometimes referred to as ‘ethnographic Tibet’ covers a much larger area than the Tibetan Autonomous Region, including lands spreading out extensively to the east, and there are those within the Tibetan exile community who seek the restoration of this larger area as a united Tibet. Indeed, the Dalai Lama maintains there are “six million Tibetans.” In 1950 it is thought that this figure (which represents Tibetans living in the Tibet Autonomous Region and the neighbouring Chinese provinces) was around 2.5 million. The figure of six million is said to comprise 2.5 million people in the Autonomous Region, 2.9 million people in the neighbouring Chinese provinces of Qinghai, Gansu, Sichuan and Yunnan, along with 120,000 Diaspora Tibetans living in exile. More Tibetans live in the counties of the neighbouring provinces than Tibetans living within the Autonomous Region. This led the Tibetan GovernmentinExile to lay claim to all land on which Tibetans are living (2.5 million square kilometers), double the territorial size of the Autonomous Region, and predominantly territory that was never administered by the Lhasa Government, even during its forty years of independence (although always under Tibetan influence). 2.12 Although the discussion of Tibet’s history goes back many centuries, a major shortterm cause of the current position occurred in 1949, when the People’s Liberation Army of the PRC began the process of the “liberation” of Tibet. The following year, in October 1950, Chinese troops took control of the Eastern Tibetan region of Chamdo. 2.13 In 1951 Mao Zedong and the Dalai Lama concluded a 17point agreement on Tibet’s relationship with the PRC. It appeared to ensure that Tibet would remain autonomous but with responsibility for foreign affairs passing to China. The legitimacy of the 17point agreement was questioned by many, who argued that the young Dalai Lama had been faced with little choice but to sign. 2.14 During the 1950s, the government of the PRC began to take a range of political, economic, social and cultural measures, which had the effect of moving Tibet towards much greater absorption within China. In essence, a class struggle involving harsh subjection and oppression was perpetuated by the Communists, leading to unrest and resistance against Chinese rule. The disturbances spilled over into Tibet proper, leading to a widespread Tibetan revolt in 1959. As a result, scores of Chinese troops entered Tibet. The Dalai Lama and the Tibetan Government fled into India, where they remain in exile. 2.15 Tibet became one of China’s ‘Autonomous Regions’ in 1965. For critics of Chinese rule, whether they favour Tibetan independence or “meaningful autonomy”, Tibet has de facto been fully incorporated into the PRC. As the leader of the Tibetan ‘Government in Exile’, His Holiness the Dalai Lama leads those calling for “meaningful autonomy”. 2.17 Throughout the visit, we were mindful of Britain’s responsibility for the role it has played in the shaping of Tibet’s twentieth century history. We were conscious of the deep and unhealed historical barriers that can lie between peoples for instance, Britain’s role in the Opium Wars or the effects of China’s Cultural Revolution and the misunderstandings that can arise as a result. 2.18 In 1903-04, at the instigation of Lord Curzon, the Indian viceroy, and under the leadership of Sir Francis Younghusband, a British military expedition invaded Tibet in order to protect colonial interest in India. It was justified by “the Great Game” of late Victorian and early Edwardian England curtailing Russian influence, creating a buffer state, clarifying borders, imposing diplomatic relations, asserting British influence. Despite 3,000 Tibetan soldiers being killed during the campaign, the British believed that they were welcome liberators. Lhasa’s inhabitants greeted the British force with clapping. In reality, in Tibetan culture the clapping gestures were a hostile rebuke and an attempt to fend off the unwanted effects of occupation but on such misconceptions are differing forms of history based. 2.19 Following the British invasion, the thirteenth Dalai Lama fled to Mongolia. He returned after a treaty was concluded and the withdrawal of the British force. In 1910, emulating the British, the Chinese sent soldiers to Tibet, forcing the Dalai Lama into exile once more. This time (as his successor would do fifty years later) he went to India. He was befriended by Charles Bell, a British official who spoke fluent Tibetan, who became a trusted mentor spending a year in Lhasa ten years later. 3.1 The chief aim of the visit was to explore opportunities for dialogue between the Dalai Lama and China. Currently, relations between China and His Holiness, The Dalai Lama remain very poor. Talks between the Dalai Lama’s representatives and Beijing have been suspended since summer 2007. We are not aware of any current plans to reopen the negotiations in the near future. 3.3 We did not recognise this portrayal of the Dalai Lama who, amongst other accolades, was made a Nobel Peace Prize Laureate in 1989. The Dalai Lama holds moderate opinion within the Tibetan Exile community. Inflammatory rhetoric is destructive. In our view, the Dalai Lama is in fact a potential ally of China; only he has the moral leadership to deliver a settlement acceptable to the Tibetan people. The “Middle Way” approach he has outlined of seeking “meaningful autonomy”, as opposed to full independence for Tibet, gives an indication as to what such a settlement may look like. 3.4 The delegates were insistent that common ground should be sought and can be found between the PRC and the Tibetan ‘Government in Exile’. Despite strong rhetoric on the part of the Chinese, James Gray impressed upon Ministers an argument of enlightened selfinterest: resolution of this issue would disproportionately serve to further China’s standing in the world. 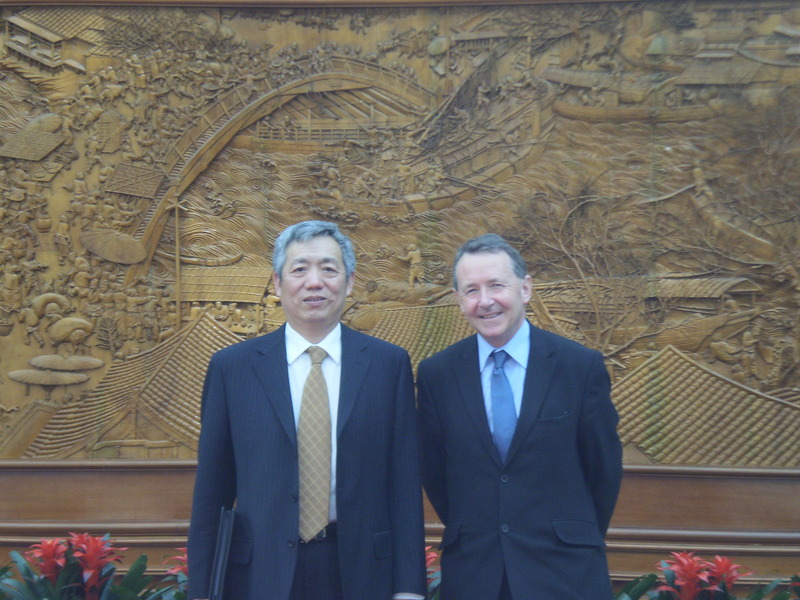 3.5 Lord Steel drew the analogy of the troubles in Northern Ireland in a meeting with Mr. Zhu Weiqun, Vice Minister of the United Front Work Department. In Northern Ireland the UK was faced with a different set of circumstances but a comparable impasse. Lord Steel pointed out to Mr. Weiqun the extraordinary measures the UK Government took in reaching the Good Friday Agreement in 1998, including the creation of a devolved assembly, the release of prisoners, and speaking with leaders of dissident groups who may otherwise have been regarded as criminals. As the first Speaker of the Scottish Parliament, Lord Steel presented the example of the UK models of devolution, an attempt to reconcile both unity and an advanced level of autonomy. We believe that the Chinese Government should explore the models of devolution in the UK. 3.6 Reflecting further upon the Northern Ireland analogy, Derek Wyatt provided further examples of South Africa, Sri Lanka, and the Middle East where intractable standoffs were traded for peace talks, involving considerable sacrifice and political loss of face in pursuit of a greater hope. China’s own precedent of Hong Kong and the “one country, two systems” approach adopted, was cited by the delegation as an instance of a flexible and creative way of resolving a difficult political situation. In addition, it was suggested to Mr. Weiqun that an independent interlocutor, akin to the role played by Senator Mitchell in Northern Ireland, may help to facilitate and focus discussion on the issues. 3.7 In the aftermath of the March 2008 riots, the Dalai Lama trenchantly condemned violence as a means of procuring change in Tibet. He has also accepted (as the British Government did earlier this year, although without any parliamentary debate) that Tibet is part of China but believes that it should be allowed significant autonomy. He has repudiated any return to feudalism and stated that he is willing to accept a spiritual role, rather than a political one. With sufficient goodwill and determination on both sides, these four principles could form the basis of a firm settlement with the government of the PRC. 3.8 How China deals with the Dalai Lama and adherents of his faith will be a test of their statecraft. The Dalai Lama may be seen as a political problem but this is to ignore his role as one of the world’s foremost spiritual leaders. Lord Alton proposed that consideration be given to the making of a religious Concordat with the Dalai Lama, which might designate Lhasa as a holy city, comparable to the standing enjoyed by the Pope and the Holy See in Vatican City within Italy. 3.9 Both sides want peace as well as a prosperous, bright future for Tibet. That future will only be achieved if both sides work together. Moreover, without cooperation there remains a serious risk of working at crosspurposes, giving rise to an escalation of hostility, and violence. Dialogue represents the best hope of averting that course. 3.10 The delegation believes that there is a real opportunity for dialogue between the PRC and the Dalai Lama. We believe that common ground exists between both parties and should be explored with a view to resolution. (d) expressing his desire for a constructive dialogue, as well as a peaceful and just future for Tibet. (d) emphasizing a desire for “social harmony” in the 17th Communist Party Congress. 3.13 The delegation recommends that this dialogue take the form of a facetoface meeting between the Dalai Lama, himself, and a senior member of the government of the PC: either the President, Prime Minister or Foreign Minister. We note the strong merits of an independent intermediary assisting in those talks. We recall the beneficial role of mediators in Northern Ireland, Sri Lanka, and South Africa, amongst others. 4.1 Concerns over religious liberty were foremost amongst the matters upon which the delegation pressed representatives of the PRC. Religion, especially Buddhism, is a fundamental part of Tibetan culture. In a meeting at the headquarters of Ethnic and Religious Affairs Commission of Tibet Autonomous Region, we were told that there were over 1,700 religious venues in Tibet. We were deeply struck by the popular piety of the Tibetan people and the relative freedom in which they were able to practice their faith. Any attempts to resolve the political situation in Tibet must take due account is of the profound spiritual life of Tibetan people. 4.2 Religious liberty is guaranteed by international law, specifically Article 18 of the Universal Declaration on Human Rights. Mr. Sonam Rinzen of the Ethnic and Religious Affairs Commission of Tibet Autonomous Region told the delegation how domestic law also affords legal protection for religion in Article 36 of the Constitution, which stipulates: “Citizens of the People’s Republic of China enjoy freedom of religious belief”. This represents significant progress since Mao Zedong’s statement, in an encounter with the Dalai Lama in 1955, that “religion is poison”. 4.3 We welcomed the 700m RMB the Chinese government is investing in the repair of the monasteries and improvement of religious sites. Of course, much of this repair arises from the damage caused by both neglect and destruction during the Cultural Revolution. 4.4 However, despite this ostensible support for religious practice, problems remain. The question of the freedom of religion in Tibet is inextricably linked to the discussion of relations with the Dalai Lama. In our view, where religious liberties are enjoyed and conferred by the State, instead of undermining its unity, the State invariably becomes the beneficiary of the good, which that religion is then free to promote. In countries such as the United States religious organisations provide an engine for social, charitable, and voluntary endeavour. China knows, through its own experience in Hong Kong, what an important part free religious belief plays in the makeup of its character. 4.5 Where, on the other hand, a religion and its leaders are vilified, imprisoned, regulated, or driven underground, it turns the adherents of that faith into enemies of the State. The younger generation of believers, especially, are invariably alienated and radicalised. Their grievance becomes a causus belli against the State. 4.6 We are mindful that membership of the ruling Communist party still requires a personal disavowal of any religious confession. Membership of the Communist Party of China is a means of social mobility and an informal prerequisite to appointment to political office. The effect of this party membership requirement, therefore, is the inability of religious people to occupy official positions and be duly represented in government as would otherwise naturally be the case. Furthermore, we are of the view that the tight controls upon religious institutions fail to strike a satisfactory balance between the legitimate regulation of civic institutions and the freedom to appoint and direct administrative and spiritual matters, according the traditions and dictates of a particular confession. 4.7 There are 46,000 Tibetan monks or nuns in Tibet and the overwhelming majority of Tibetans are adherents to the Buddhist way of life. We were privileged to visit several monasteries during our trip, including the Drepung Monastery – the home monastery of the Dalai Lama, Sera Monastery, and Samye Monastery the first monastery in Tibet. By their very nature, the monasteries were peaceful places of prayer and the monks greeted us warmly. 4.8 We were told by Mr. Sibpa about the role that the Tibetan Buddhist Association plays as a bridge between the the government of the PRC and the Buddhist population of Tibet. The organisation has facilitated the visit of over 10,000 Buddhists from overseas to visit Buddhist sites in Tibet. We welcome the ability of pilgrims to visit holy sites in Tibet. 4.9 On one of our own visits, at Drepung Monastery, we followed up on the questions previously posed by Minister of State Ivan Lewis MP concerning the disappearance of 400 monks following the unrest in March 2008. Our guide, a monk, told us that there were 6 monks missing who had participated in the demonstrations. When questioned on the numbers of monks at the monastery, he said that there were about 500 monks registered before the protests and 500 monks registered after. He said he did not know the 6 missing monks, and didn’t know any other monks at the monastery who knew them. 4.10 We were left to assume that the monks who disappeared may not have been formally registered at Drepung (though still resident) and/or the unwillingness to disclose further information arose out of a fear of the consequences that may result from revealing disappearances to visitors such as ourselves. 4.11 The governance of monasteries was also questioned. We learned that each monastery has a Management Committee upon which Communist party officials sit, together with some selected monks from the monastery. These committees are responsible for the administrative affairs of the monastery including finance, recruitment and building work, but also had the capacity to adjudicate upon more religious matters, such as the appointment of the Abbot of the monastery. The spiritual ambit of these compulsory Management Committees struck us an unnecessary encroachment upon the integrity of the monasteries. 4.12 We were further concerned about restrictions on the extent to which religious expression is permitted and the “patriotic reeducation” aimed at qualifying religious belief. For example, photographs of the Dalai Lama are illegal in Tibet and people are forced to denounce him as a spiritual leader. We deeply regret these measures and hope that the government of the PRC will move to a position where it accepts the Dalai Lama’s religious role and where monasteries are able to display his image without the reproach of severe criminal charges. Lord Steel spoke of the parallel with this policy and the UK Government’s former policy of banning Martin McGuiness from the television and radio. Martin McGuiness is currently the Deputy First Minister of the Northern Ireland Assembly. 4.13 There are four mosques in the Tibetan Autonomous Region, two of which are located within Lhasa, and there are approximately 4,000 to 5,000 Muslims registered in Tibet, a figure which excludes recent migrants. 4.14 Though we visited no mosque within the Tibetan Autonomous Region, we were fortunate to go to The Great Mosque of Xining, the Dongguan Masjid Mosque. It is one the four largest mosques in Northwest China and is the largest and most important mosque in Qinghai Province. The mosque dates from the 14th century but was destroyed and rebuilt entirely as recently as the late nineteenth century. It was further renovated in 1914 and enlarged in 1946. 4.15 The visit to the Mosque served as a reminder of the religious pluralism, which exists within China. Religious pluralism presents many challenges – during our limited time at The Great Mosque of Xining, at least, there seemed to be a positive and open atmosphere of worship. 4.16 We were told that the number of Christians in Tibet is relatively small. Only one Church exists: a Catholic church with around 700 parishioners, located in the community of Yanjing in the East of the Tibetan Autonomous Region. Lord Steel and Lord Alton presented some religious books as gifts to be given to that community, which Mr. Sonam Rinzen, a local official, undertook to pass on to them. 4.17 The delegation encourages a further relaxation of the control exercised over religious institutions in Tibet and China as a whole. We believe that regulation is justified but that the State should allow for greater autonomy on the part of religious communities. 5.1 We welcome the progress that China has made in protecting and promoting universal human rights, guaranteed under international law. Among a long list of improvements, the scope of freedom of expression has increased, and living standards have improved amongst a broad stratum of the citizenry. The government of the PRC has even sanctioned human rights education for law students. On repeated occasions Chinese officials were keen to impress upon us China’s strong commitment to human rights norms. 5.2 Mr. Zha Peixin of the National People’s Congress told us how in 2004 the constitution was amended to recognise the expression ‘human rights’. He further explained that China was “willing to learn from other countries. In a separate meeting after the official programme of the delegation, Lord Alton was told by Dr. Shen Yongxiang, the Minister responsible for the UKChina dialogue on human rights, that he had been given a mandate to “deepen and extend human rights”. 5.3 Several factors have determined this positive trajectory away from the wanton brutality of Mao’s regime and the Tiananmen Square massacre. Foremost amongst them is China’s view, rightly held, that compliance with international human rights standards as necessary to maintain a sense of legitimacy on the world stage and amongst a domestic population increasingly informed about human rights. 5.4 However, NGO reports and local intelligence paint a radically different picture. Persistent and tragic abuses alleged include: the use of torture; the widespread use of the death penalty; disappearances of political dissidents; abuses of reproductive rights including forced sterilisation and abortion. Other instances reported include restrictions on the freedoms of assembly; freedom of religion (see above); censorship, including stringent curbs on access to internet sites; and discrimination on the basis of health status, party membership and social origin. 5.5 Of particular note, the reprisals following the March 2008 demonstrations across the Tibet Autonomous Region and beyond are deeply troubling and we expressed our concern on several occasions. We recognise the difficulty facing law enforcement agencies at that time in dealing with the situation of mass demonstrations where criminal acts were taking place. Alleged offences included assaulting police officers, criminal damage and arson. In our view, the use of violence by demonstrators serves to undermine their cause, not advance it. However, we share the concerns expressed by Human Rights Watch and others that such offences may have been used as a way of repressing political dissent. 5.6 Lord Alton, following up on cases raised by Mr. Ivan Lewis, made a personal appeal for clemency in 3 specific cases. 5.7 The first case raised was that of Mr. Wangdu, a Tibetan public health worker, who was sentenced to life imprisonment by the Lhasa City Intermediary People’s Court for allegedly forwarding information to people outside Tibet. 5.8 Lord Alton also raised the cases of Lobsang Gyaltsen and Loyak who were sentenced to death with no reprieve on April 8 2009 by the Lhasa Intermediate People’s Court. They had been found guilty of arson attacks in Lhasa on 14th March 2008 that led to the confirmed deaths of Chinese citizens. They could be executed at any time. 5.9 We strongly urged Mr. Nima Ciren, VicePresident of the Standing Committee of the People’s Congress of the TAR, to intervene in those cases and to follow in all cases the principles of a fair trial including desisting from the use arbitrary detention, the use of torture and the death penalty. 5.10 Regrettably, penetrating these cases was almost impossible. All cases were met with the general refrain that due process and criminal procedure were adhered to in punishing criminal acts committed during the protests, without discussion of the details of individual cases. We look forward to a written reply in the cases we raised. 6.1 The economic and social development of Tibet in recent years has been considerable. We were able to see the vast progress which has been made in recent years. 6.2 We were told that in one year alone (200607), GDP had increased by 14% (34.219 billion RMB) and that the local economy was thriving, thanks, in part, to investment from the national government. This has had a decided impact upon living conditions of Tibetans, especially in the countryside. 172,000 households from the rural population have been moved into reliable and comfortable homes with running water, electricity and sanitation. 6.3 We visited Chenba village, in Rong Township, Sangri County and saw first hand the excellent new homes constructed by the government. Ms. Lhamu, Head of Chenba village proudly showed us around the village hall and her home. She explained how they maintain their traditional way of life as farmers, whilst enjoying the benefits of modern amenities. Their children are able to go to school in the neighbouring village. 6.4 We were told of the progress that has been made in primary and secondary education, higher education, and vocational education. The government invested 3.276 billion RMB in the development of the education undertaking in 2007, an increase of 22.34% over the previous year. This increased investment was used primarily to increase provision of rural compulsory education, as well as for textbooks for students in more urban settings and purchase teaching equipment for elementary and junior schools. 6.5 In Tibet there are 884 elementary schools, 117 regular high schools and 10 secondary vocational schools; in addition to six institutions of higher learning, including Tibet University which we were able to visit. The new Lhasa campus of the Tibet University was completed in 2007 at a cost of 500m RMB, and accommodates 8000 students. In our view such capital investment demonstrated an important commitment to education in the Tibet. 6.6 We were struck by the efforts being made by the central and regional governments to preserve Tibetan culture. On our visits to Tibet University, the Museum of Tibetan Medicine and Culture in Xining, and the Tibet Museum in Lhasa we saw firsthand the extent to which Tibetan culture was valued and preserved. 6.8 In a visit to Lalu Wetland Reserve, an area covering 12.2 square kilometres, we observed the importance attached to environmental conservation. 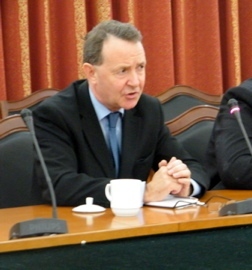 James Gray praised the efforts being made to conserve the rich and unique, though fragile, ecosystem in Lhasa. Lalu Wetland Reserve is the highest and largest of its kind anywhere in China and its core area covers 11.5% of the city. 6.9 We firmly hope that in the face of the pressures associated with economic development, these efforts continue and are extended. 6.10 The delegation affirms the impressive efforts being made to protect the environment through measures such as national parks. Such efforts should continue and be furthered against the pressures on the environment that arise from tourism and economic development. 6.11 The delegation further affirms and encourages the work being done to preserve Tibetan culture. We recommend that links be established between the various institutions conserving and promoting Tibetan culture and the British Library. We hope the British Library will share its unparalleled and vast expertise in the preservation of volumes and manuscripts, as well as the digitalisation of such material in order to ensure the rich collections in Tibet are widely available for study. 6.12 The delegation notes with encouragement the investment in university and vocational education and considerable provision of primary and secondary education. 7.1 The Foreign Secretary issued a Written Ministerial Statement on 29 October 2008 recognising Tibet as part of China and recognising Chinese sovereignty over Tibet. This brought the UK’s policy in line with other EU member states, the US and the Dalai Lama himself. It is argued by the Foreign and Commonwealth Office that the previous policy which considered Tibet to be autonomous but recognised the ‘special position’ of the Chinese authorities there, clouded our ability to get our human rights concerns across. We support the Foreign Secretary’s position as a reasonable and sensible move. Needless to say, the Chinese ministers to whom we spoke were very pleased by the change. 7.2 However, we believe that the way in which this momentous announcement was made, by Written Ministerial Statement, was wrong. The matter should have been the subject of an oral statement before the House of Commons and House of Lords, with the opportunity for the Minister to clarify the Government’s position. In not allowing debate on the issue, the Foreign Office has exercised poor judgment, which has led to misunderstanding on the part of nongovernmental organisations and Tibetan exiles who feel betrayed by the recent decision. 7.3 We further believe that the apparent lack of a “quid pro quo” for the change in the UK’s position was an error. The change of position could have been used as a bargaining tool to reopen the dialogue between the China and the Dalai Lama. It appears as though the longterm situation in Tibet achieved little discernable benefit in the UK’s change of policy. 7.4 We welcome, however, the visit of Minister of State Ivan Lewis MP to Tibet in September, and look forward to sharing our observations with him. It is noteworthy that Mr. Lewis, and our own delegation, were permitted to enter Tibet given that recent requests for travel visas by the Ambassadors of France, Germany and the United States, have, along with requests from the international media, all been refused. 8.1 We were grateful recipients of Chinese hospitality (see acknowledgments). The cost of internal travel, meals and accommodation was met by the government of the PRC. The cost of return flights to Beijing was met by the All Party Parliamentary China Group, with incidental costs met by individual members of the delegation. 8.2 Members of the delegation were mindful of the controversy surrounding the rail link between Xining and Lhasa upon which they travelled to Tibet. However, the internal travel arrangements were made for us by our hosts and it would have been inappropriate in the circumstances to insist on an alternative mode of transport. Furthermore, we felt that it was important to assess the impact of the railway and we were persuaded that the best way of doing so was to experience it.